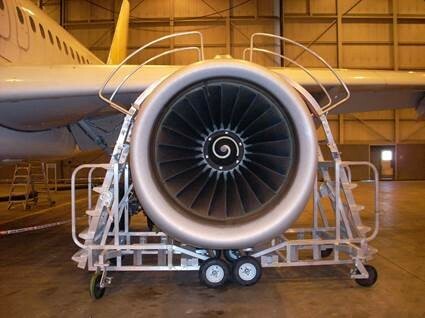 Aircraft Pylon Access Ladder- For exclusive use on narrow and wide body aricrafts ranging from the 737 to the A320-A321 and added versatility from removable side rails, this ladder improves access to the pylon area above aircraft engines. The lightweight and mobile aluminum design features a curved platform, bolt-on side rail cantilevers, tool tray, upgraded wheels and casters, and locking mechanisms on both sides allowing for easy access to the pylon area safely and comfortably. For interest in this product for aircraft not listed above please CONTACT US. The innovative curved design of the ladder allows safe access to the pylon area without the risk of danger to the workers and the aircraft. 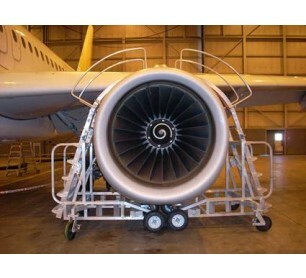 Use of the ladder in sets of 2 is recommended, one for both inboard and outboard sides of the aircraft.